This one is an accomplishment. My friends told me this look like a mini wedding cake with pipings and all. Less words and more photo for this post. Pardon me but I couldn't resist to not snap away and post it. Why? Because it is such a beauty from every angle. Check out the up close shot of the piping. Velvety white. Check out the cross section but again forgive me for the scary image behind. A hungry gluten who can't wait to take a bite into the cake. Yes my dear readers. This ain't a two-layered cake sandwiched with buttercream frosting. This is a meatloaf cake. The 'frosting' used are mashed potato! The 'cakes' are meatloaf. It is easier to work with mashed potato rather than real buttercream. They work fine at room temperature. Unlike, buttercream, requires chilling and in and out of the fridge. The little red dots are tomato sauce, not bits of maraschino cherries. This is how it look when I apply my first layer of frosting. This one after being touched-up a lil'. Still a little messy. No worries, I've got tonnes of 'buttercream' to pipe all over and cover up my messiness. I wanted to give it a simple finish. Piped a simple shell border and that's it. But I realise it was pretty hard to pipe a shell border evenly and without having to keep stopping and rotating. Point to note, no Lazy Susan used here! Important tip: squeeze the tomato sauce upon serving. It smears into the potato! See how it smear in the picture above. I have to remove each and every rosette and pipe a new one again and squeeze tomato sauce over each rosettes again upon serving. My beautiful orange 7 inch round pan that I bought from eBay which comes along with a 12 holes mini muffin tray for just 5bucks. Used pans of course. No worries, really very lightly used. I could see it myself. 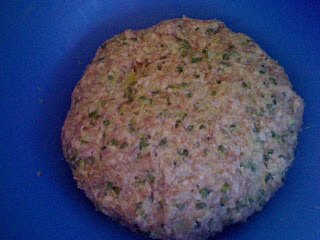 Make sure to compress the meatloaf really well into the pan and grease the pan well before baking it in the oven. 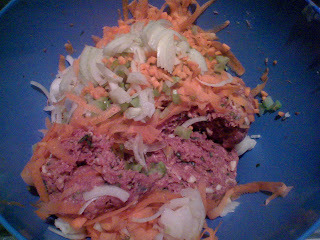 I screw up the first layer of meatloaf a little. It cracked and split when I was trying to turn it out onto a serving plate to cool. You didn't notice within all the pictures do you? I got the recipe from finefuriouslife. She made them into little muffins and I made them into 2 7-inches meatloaf patties AND also 6 mini meatloaf muffins also from her recipe. Reason is because I am left with some potato frosting and I dunno what to do with it. 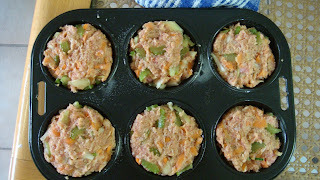 Too little for a Shepherd's Pie so I made only 6 medium sized muffins with halve her recipe. 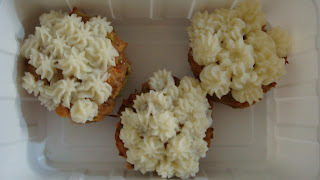 I simply pipe little rosettes on each muffin and send them off tho my landlord's family. Glad she likes it! Not gonna retype the recipe here because I want you people to click on Michele's link. Her ideas of making these into muffins and use beetroot juice to tint the mashed potato are ingenious! Thanks again Michele. Everyone loves it! Since I made two meatloaf patties instead of muffin for the cake, I bake them with the same temperature for an hour each. Maybe cuz I am using Mozarella cheese in place of the Parmesan, they took a longer time to cook and kinda stick to the pan a little. Also, the patties harden upon cooling. It is normal if it's soft when fresh out of the oven for this recipe. For the mashed potato frosting, I used the same recipe from my Grilled Basa Fillet with Mashed Potato & Gravy. No-fail and always delicious. That's it. Enjoy and surprise your loved ones with this cake. They would be so surprised I assure you! hi!! can you please post the recipe up? the links you gave dont work ):thanks in advance! I see the link no longer works, I unfortunately do not have the recipe. Just google meat cake and you get loads of recipes in return, meat cupcake is amazing too!! !